Owing to our industry practice, we present to our honored patrons an exclusive range of Biodegradable Plastic Bags. These bags are made by professionals employing the finest quality input and sophisticated technology. Our presented bags are highly used in the market owing to their features. Moreover, our honored clients can avail these bags from us at market leading prices. Incorporated in the year 1977, G.R. Virindera Industries is a pioneering name indulged in bringing forth a broad collection of Biodegradable Garbage Bags, Biodegradable Biomedical Waste Bags, Autoclavable Bags, Biodegradable Bags and Food Grade Bags. 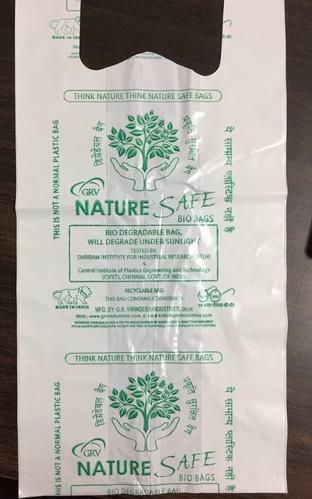 These bags are extremely praised in the market due to their long lasting nature, water proof nature, easy to carry, environment friendly, tear resistance and small prices. Our bags are made utilizing the finest quality input, which is bought from the trustworthy vendors of industry. Furthermore, our bags undergo several rigorous quality checks to make sure top strength and long lasting nature. In addition to this, we provide all the bags in varied designs, colors and shapes. For meeting the demands and requirements of our prestigious customers, we also provide customized packaging facility.